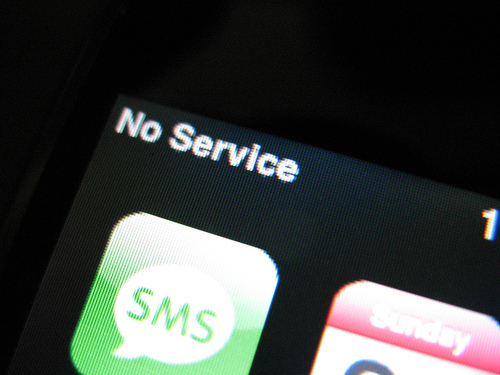 Does the government have a right to shut down telecommunications services? Press.Tv reports that Pakistan has suspended mobile phone services in several major cities to prevent terror attacks on minority Shia groups as they celebrate the holy month of Muharram. The rationale behind the suspension is that the terrorist use mobile phone services to detonate bombs and as a result the suspension of mobile phone services would help prevent such attacks. Meanwhile, Ihsanullah Ihsan, a spokesman for the militants’ umbrella group, the Tehrik-e Taliban Pakistan (TTP), has claimed that suspending mobile phone services will not hold them back from carrying out their deadly attacks against the Shia Muslims. This is ultimately a case of the government having too much power, the real threat of terrorist using bombs somehow resulted in a government issued communications blackout throughout the country–which does little to prevent the terrorist who are hell bent on killing. I’m guessing that cellphones are picked as detonators for their ubiquity and range, however if you remove the cellphone from the equation you still have hundreds of possible detonation mechanisms, including timers (like the ones from early Mission Impossible shows), walkie talkies and even just a person standing by the bomb and detonating himself with it. While many of us are of the opinion that a government should do everything to protect it’s citizens, we often fail to to realize that the mechanisms the governments utilize to protect us has a cost–a cost usually paid for by the very people they are supposed to protect. A full blown mobile service block, doesn’t just block the terrorist–they block everyone. From a father frantically trying to locate his daughter, a hospital trying to locate next of kin in an emergency, or even a blood bank trying to contact its donors. This sort of carpet block is not an effective solution and the cost of it usually far outweigh the benefit, with the benefit being ZERO if the terrorist find some other way to detonate the bomb in spite of the block. Terrorism isn’t a crime against people or property. It’s a crime against our minds, using the death of innocents and destruction of property to make us fearful. Terrorists use the media to magnify their actions and further spread fear. And when we react out of fear, when we change our policy to make our country less open, the terrorists succeed — even if their attacks fail. But when we refuse to be terrorized, when we’re indomitable in the face of terror, the terrorists fail — even if their attacks succeed. The goal of any terrorist organization isn’t to kill anyone, that’s basically a side-effect of what they’re trying to do. The goal of a terrorist is to terrorize! A terrorist organization has succeeded if it has terrorized society to the point that society has changed to accommodate its will. Ultimately the few thousands that any organization can kill is pittance in relation to the population of a country like Pakistan, but the over-arching goal of the organization is to instill fear into the hearts of the hundreds of millions, that’s the point–that’s where they really succeed. So to have a carpet mobile phone service block isn’t just ineffective against the terrorist–it actually signals to them that they’ve won, simply because they’ve managed to do what it is they set out to do–terrorize. During the Rwandan genocide in 1994, the United States strongly considered jamming the radio signal of Radio Rwanda(RTFL), a government linked mouthpiece that incited violence against the Tutsis. It’s hard not to imagine, just how much bloodshed the Americans could have saved had they shutdown a key source of hate speech during (and before) the genocide. The US operates on principles of freedom of speech and it must have been a hard decision to not jam the signal of a foreign country–they had no legal right to do so. The key point of course isn’t Radio Rwanda (RTFL), but rather the political backdrop of which it operated. In almost every case of genocide, there is a propaganda machine to coordinate and incite regular people to commit acts of unspeakable horror, it is in this instance that people argue against freedom of speech, that governments have not just a right–but a duty–to block and stem the flow of incitement via speech. However, what people fail to realize is that in almost every case of genocide–before even the first victim is killed–freedom of speech is first curtailed. It is only against a backdrop where freedom of speech is curtailed that genocide is made possible. In the last 3 instances where the world has witness genocide–we always witness the curtailing of the universal right to free speech FIRST and THEN the genocide. After all those who advocate against freedom of speech, usually advocate strong government powers with regards to curtailing speech, and if the government itself is implicit in genocide–what’s the point? 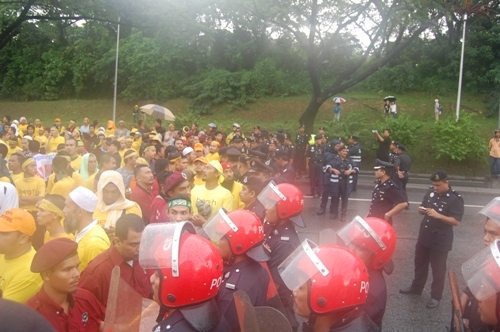 I often wonder, how May 13th 1969 would have been different for Malaysia if we had implemented freedom of speech. Could we have staved off the blood shed–or would there have been MORE? The answer isn’t as straightforward as one might think–partly because like many other Malaysia I am a bit confused as to what really went down on that fateful day. I wish I knew more, but more importantly I wish I knew the truth. Consider also the suspicions among the opposition parties that the Government was implicit in the shutting down of mobile communication services in KL during the Bersih 3.0 rally. Fortunately, the government has rubbished the claims and instead points to the technical limitations of the mobile network being unable to support the high number of protesters. What’s strange though is the official government figures state merely 20,000 people attended the rally, and it baffles me that the telecommunications services couldn’t cope with a mere 20,000 people. To put this in perspective–Sunway Pyramid has over 10,000 parking bays…and I’ve never had problems with dropped calls in Pyramid. So while I’m not questioning my governments integrity (nothing there to question really), in my mind there are only two possible explanations for the telecommunications failure during the Bersih 3.0 rally. Either the government really did jam communications or they got the official numbers wrong. I’m really hoping it was the latter but I don’t know. Anyhow, I think you already know where I stand with regards to government intervention on communications. Governments should never be granted the power to block mobile (or any other) form of communications–ever. Be it to prevent terrorist from detonating bombs or protestors to gather in square or to incite it’s own genocide. If you still believe that government should intervene, I would like you to answer one question. Who from our finest Ministers would you grant that power to? It’s all nice to say the word ‘Government’ and leave the specifics for later, but let’s assume that our Government is granted this power–who in Government would you like to grant that power to? Who would you choose to make that decision? Would you choose admitted adulterer and MCA president Chua Soi Lek to tell you what you can and cannot do on the internet? Even if you support the opposition, please enlighten me on who you would have making that decision, and let me make it clear that I do not support Nik Aziz making any decisions on what to block–cause I suspect he may block it ALL. (and besides–I think all politicians are insufferable pricks anyway). That’s the nail in the coffin of any argument that is in favor of granting government the power to block communications, in that no one can name one person they’d be comfortable with that power. I wouldn’t want anyone with that power. Governments have long had a history of control over the mass-media. However, in countries like Pakistan (where the media openly criticizes the government), we’re seeing a slow tilt towards the government having control over the telecommunications network–which one might argue is far more important to the dissemination of ideas. I for one believe that the Government has a role in regulating the telecommunications industry–particularly with regards to consumer protection, but the government has no business creating blanket orders for the outright denial of services to it’s citizens. It’s also interesting to note that similar blackouts have been issued by the governments of Syria, Egypt and even Burma.